Occupational Therapists treat disabled or injured patients of all age groups with therapeutic use of daily activities. They aid patients in acquiring, improving and recovering skills to live everyday lives hassle-free. They are required to devise care packages and advice subordinates and accompany patients in executing daily activities besides concentrating on creating evaluation tests and motivating patients. A list of such Job Description Samples follows to provide clear insights into different facets of this job. It underlines working hours; remuneration promised, types of physical and mental effort to be put in beside values to be possessed and clinical duties expected to be discharged in the treatment process. It states educational qualifications to be possessed like professional certification and license to practice, lifting requirements besides the primary functions one is expected to discharge of assisting in patient’s treatment. It mentions special requirements of possessing a particular degree or practicing license, suggested training, skills and general knowledge required besides chief duties to be executed with illustrative instances of work. 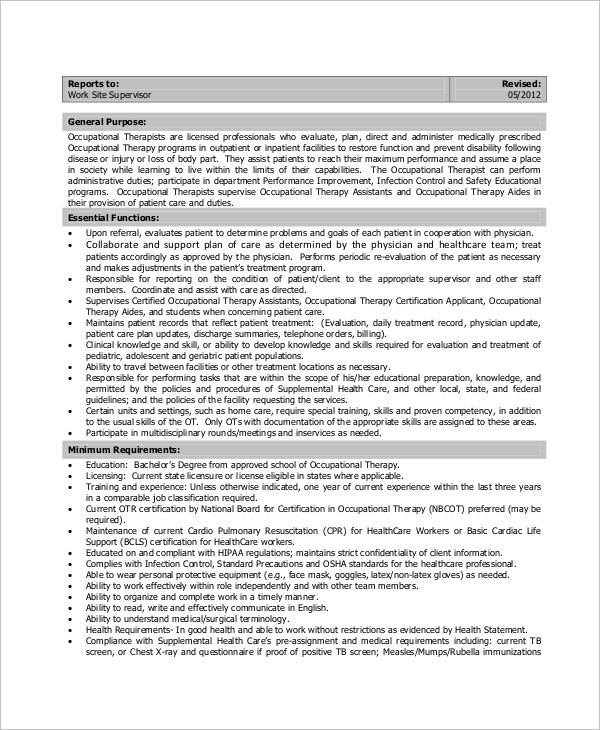 You can also see the Physician Assistant Job Description Samples. 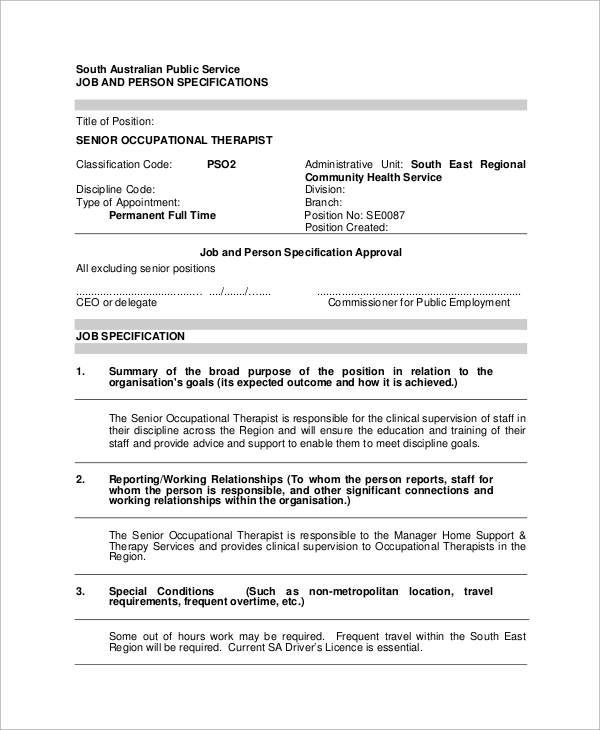 To whom is the Occupational Therapist Job Descriptions Beneficial? 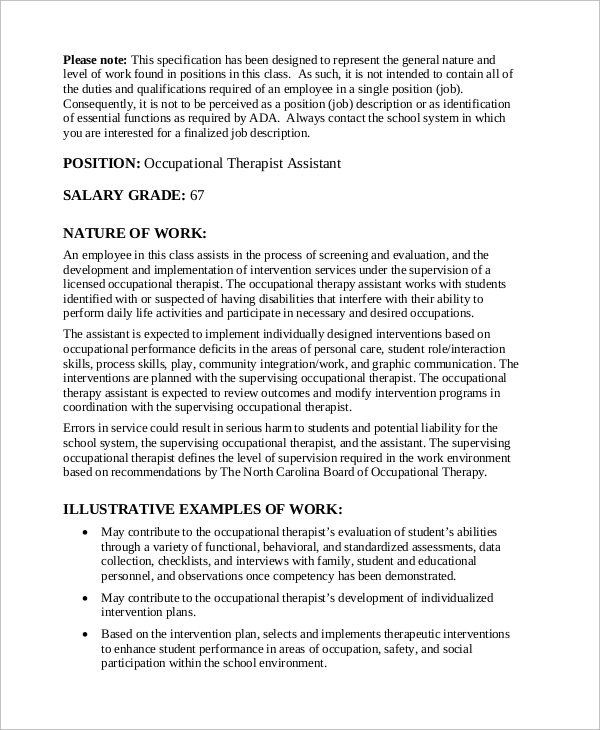 Occupational Therapist Sample Job Descriptions are beneficial to licensed practitioners or eager newcomers of neurological, pediatric or certified occupational therapy to see if they fit the requirements of the job demanded. 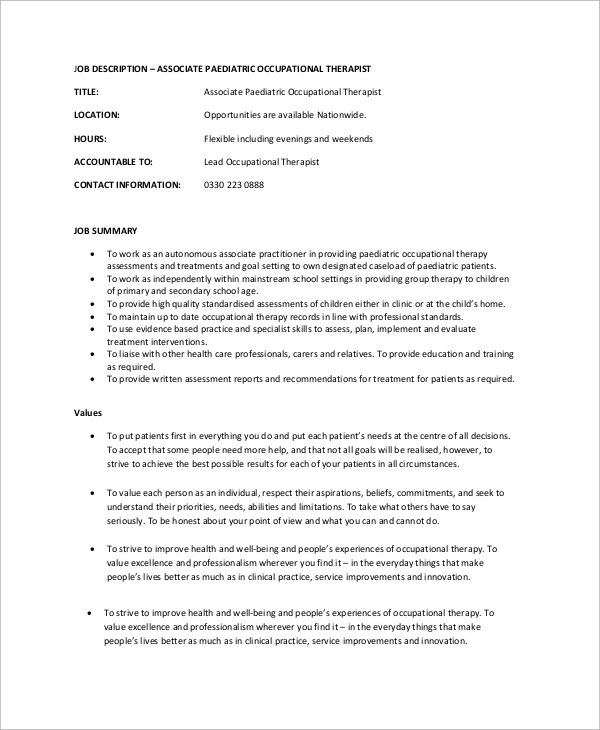 They are useful for the interested candidates who are ready to work flexibly around patients who are emotionally or physically aggressive or who are good with children to benefit disabled children studying in special schools. 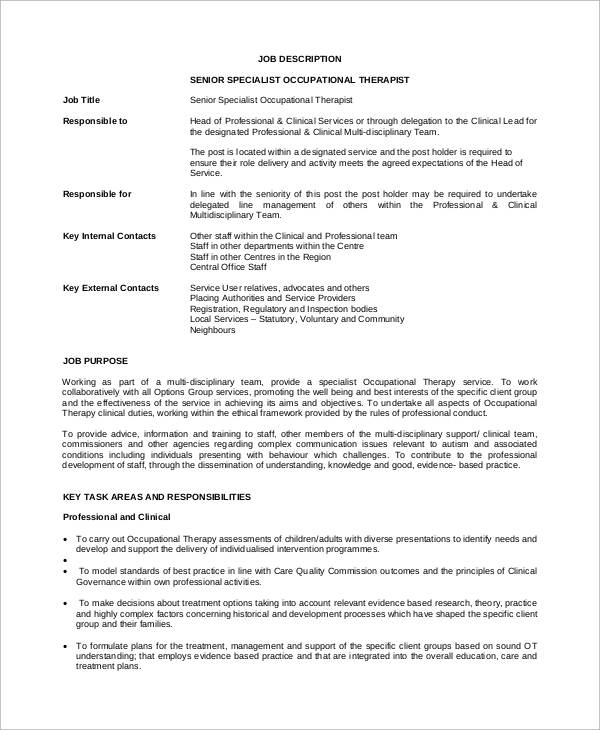 Licensed therapists who are responsible, possess values, communicating well with culturally diverse patients with good general knowledge regarding working of state, development of human body and clinical requirements of disabled people are fitted to apply. One is informed of location, working hours, payment essentials of the Job Description and values one must possess to be eligible and particularities of duties regarding assessing children and treating their ailments. 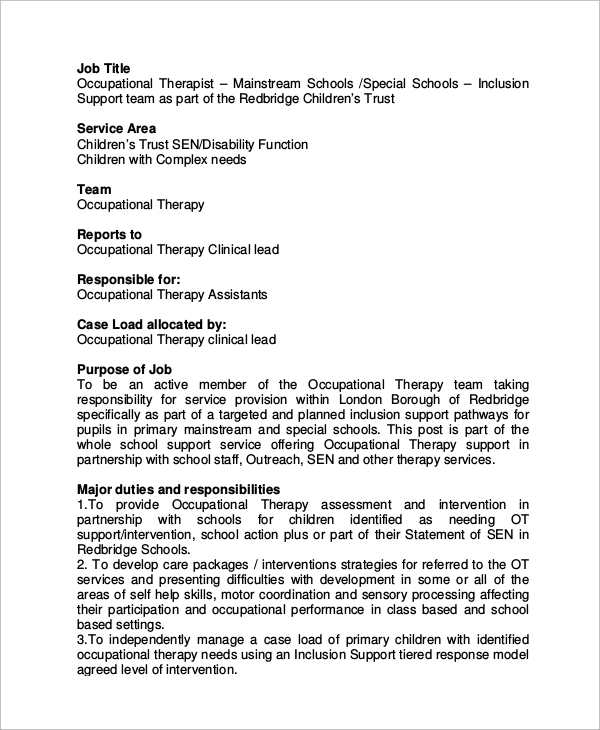 It provides criterion one must fulfill like educational and experience requirements, the service area of employment and chief duties of collaborating with special schools of disabled children who need OT intervention. 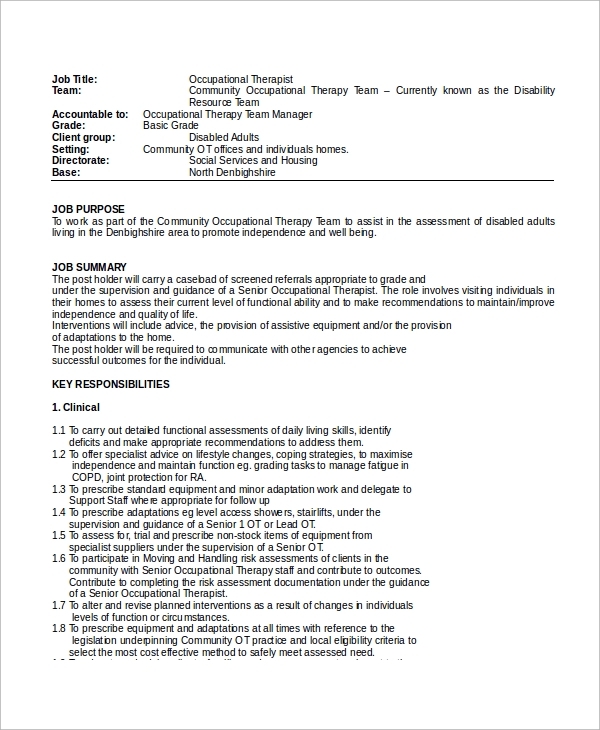 Why are Occupational Therapist Job Description Samples Helpful? 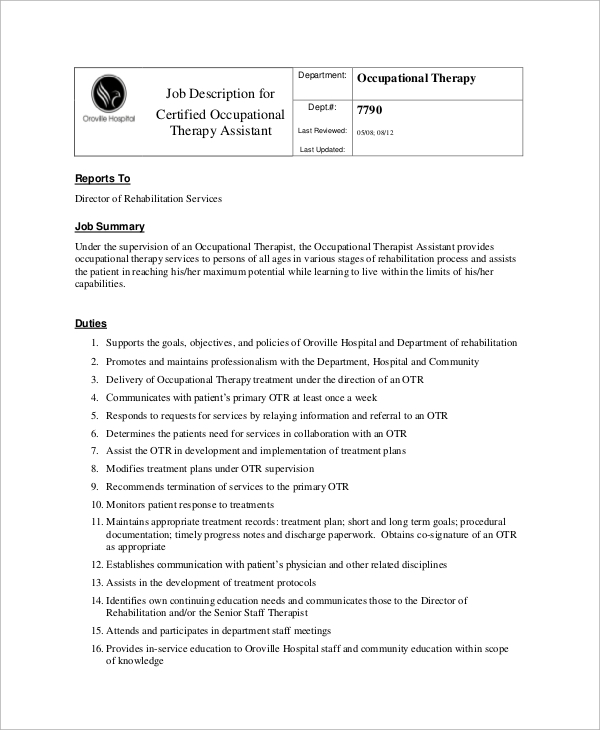 Occupational Therapist Job Description Samples are helpful because they provide detailed insight into the background of the job mentioning concise details about the educational, professional and legal certifications that the interested candidates need to possess as well as the mental, physical and emotional efforts they might be administered to put in. 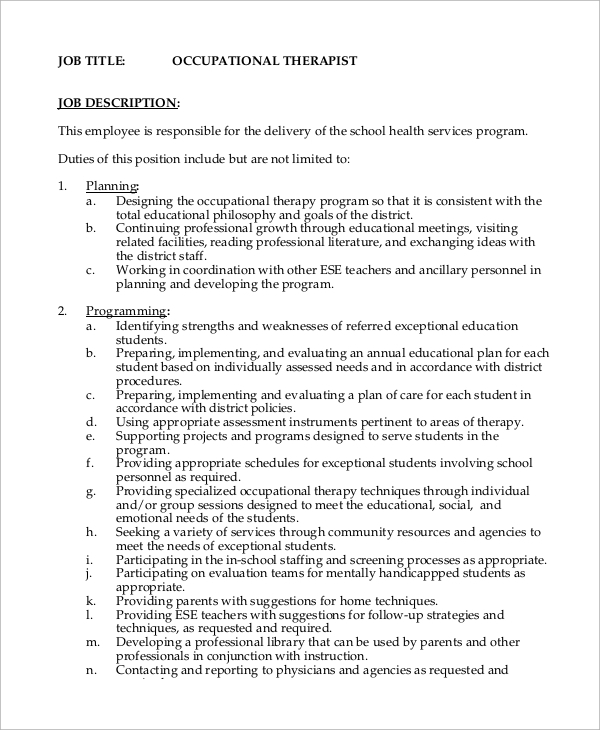 The chief duty of a therapist is mentioned in the Pediatrician Job Description Samples. It makes the candidate aware of the basic functions of evaluating standardized assessment tests, collaborating with special schools and treating disabled children in ways outlined. Details regarding working hours, financial compensation, the location of employment are provided to give a detailed picture for the eligible applicants. 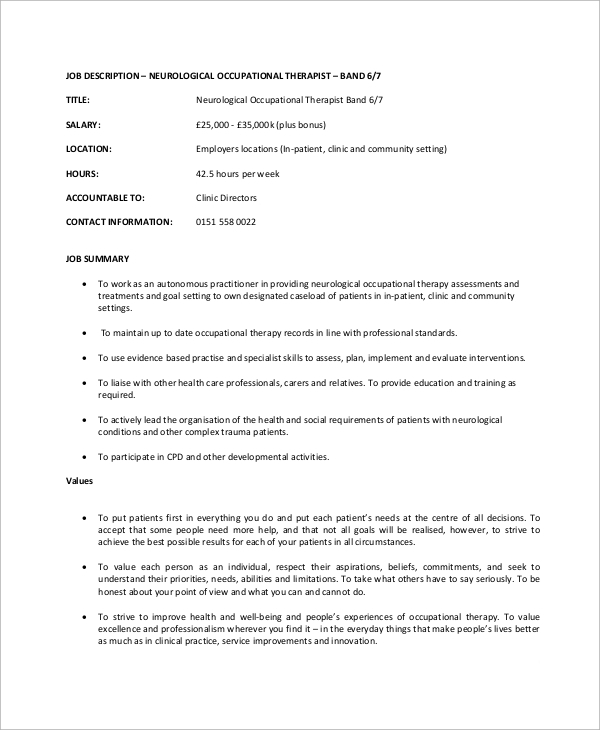 The Occupational Therapist Job Description Samples are utile to the interested candidates to prepare themselves by the clinical, educational and professional requirements to be eligible. 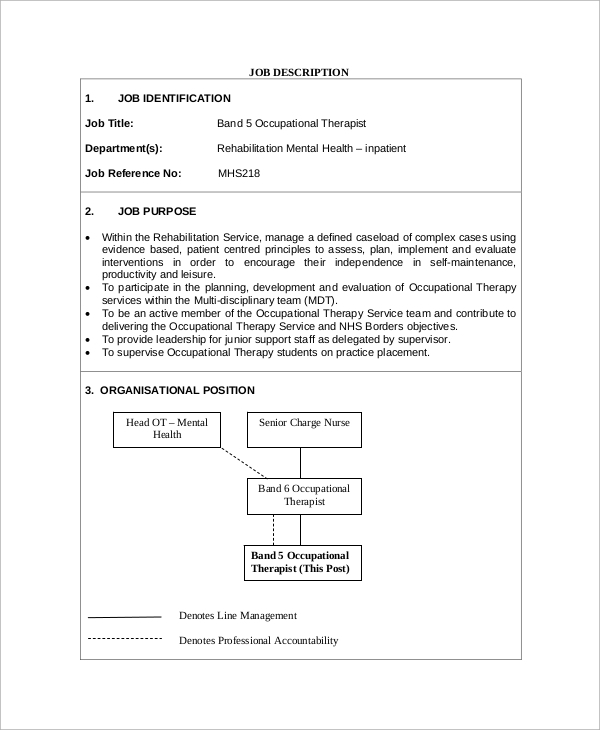 The Physical Therapist Job Description Samples mention his basal responsibilities and duties and mannerisms of work that he must fulfill to enjoy the benefits promised.